As I boarded my flight to Samoa, the sun was just rising up in the distance. I missed the food onboard as I was happily nodding away in a little nap. I woke up just in time to see the plane descending to Samoa. 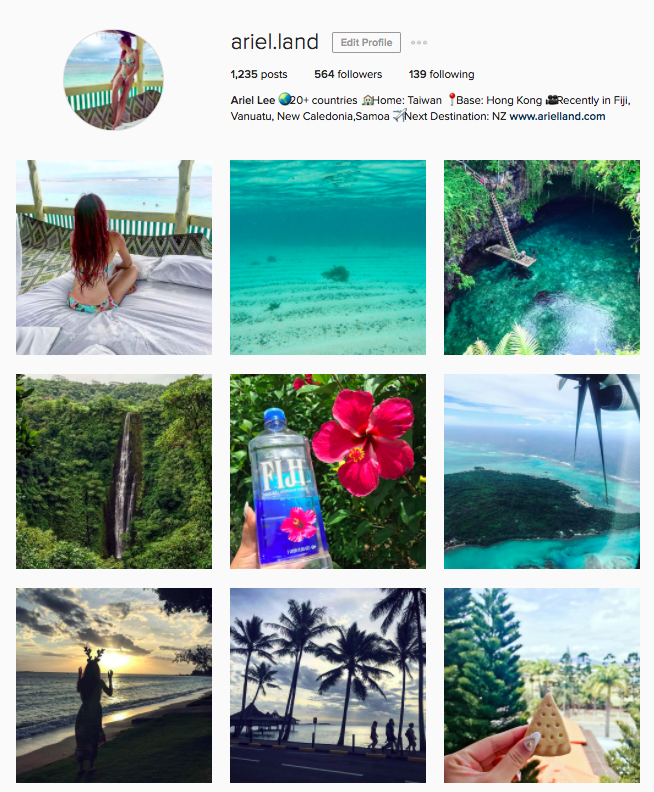 The waters were this beautiful aqua color that went from dark to light as it hits the Coast of Upolu Island. The water glistens under the sun. I guess we are guaranteed good weather again here in Samoa! Faleolo International airport is recently undergoing some renovation. Cranes and construction vehicles crowd the grounds, most seem to be from some Chinese construction company. You could sense the design of the interior and exterior were similar to that of a tier 2 Chinese city, but still very modern compared to the rest of Samoa. This new building was just put together a month ago, and they broadcasting systems is borrowed from the Chinese. Listening to announcements with in English with a Chinese accents throws me off as I walk pass the halls of this new Samoan airport. Not sure if Faleolo is new to coping with large jets flying in, as 2 large commercial flights landed at the same time, immigrations, baggage claim, and customs were chaotic and just head above waters from handling the flow of incoming passengers. Nonetheless, Samoans returning to spend time with family were cheerful and happy to be back to their hometown. 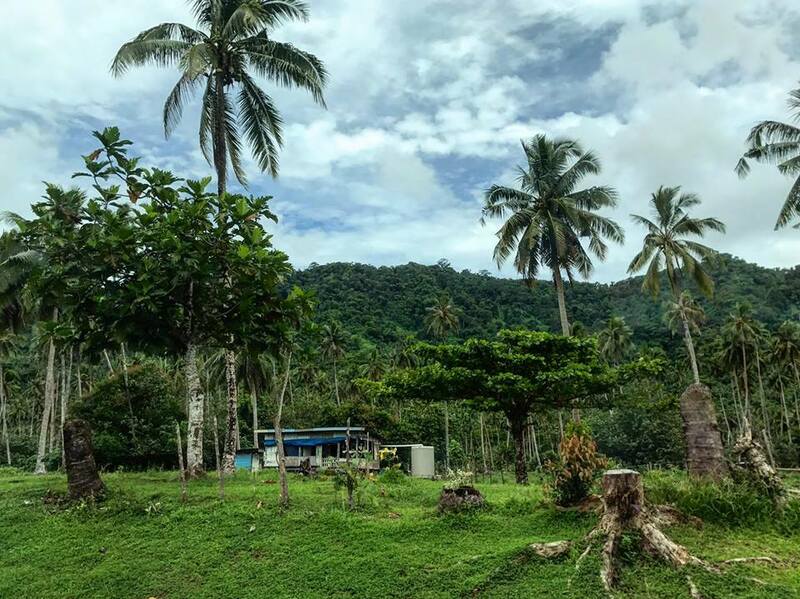 The hotel shuttle took about 45 minutes from the airport to Tanoa Hotel, passing by beaches, local houses with gardens that have chickens, pigs, and horses roaming the grounds. 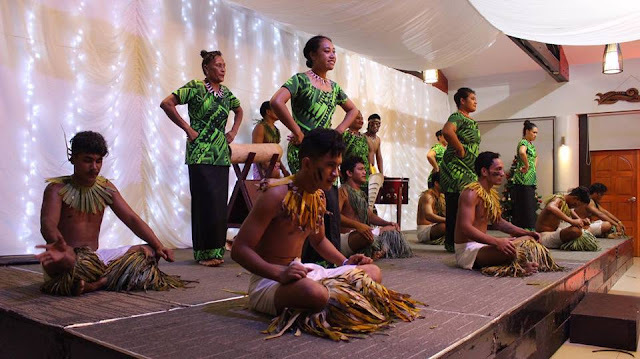 It seemed like most Samoans had house with a very large lawn, and on the lawn is this gathering place, usually built in a rectangular shape with many thick round pillars around it. There the people sit under the roof but can still enjoy the fresh air and sea breeze while they chat away and the kids run around. The Samoans are also serious about their gardening. Everywhere you see colorful plants of all sorts, lined neatly along the side of their gardens. I said the weather was nice, a little bit too nice. It was a blazing 30C with no clouds. And under no shade I thought I could fry an egg on my forehead. It’s still a public holiday here, so after a short 15 min walk I was ready to head back to the hotel to rest. I bought some snacks at a local supermarket, and was glad to be back at the air-conditioned hotel room as I was drenched in sweat. After cooling down, I head down to the small poolside restaurant to grab a bite. To keep up with the one beer per country, I ordered the Samoan National beer – Taula. Along with it, a Wok tossed dish with spicy fried rice ont the bottom, grilled chicken and egg on top. It was so delicious I ended up having it 3 times throughout my stay in Samoa. The tour desk wasn’t opened so nothing was on the agenda for tomorrow, however the hotel said they can book a taxi for a day to drive around just for $300 Tala. After finishing up on some video editing, I head to bed for yet another early wake up at 6:30am. Resorts with breakfast included are the best! I always manage to eat the biggest breakfasts when on holiday – 2 toasts, 3 pancakes, 1 bowl of cereal, scrambled eggs, and some fruits. Though to be fair, I didn’t have food until dinner afterwards. The driver picked us up at 9:30am and first we head south to Papapapai Waterfall. Just on the edge of a steep valley, the Waterfall is a 20 meter drop to another smaller waterfall down the stream. On the top of the waterfall sits a small village. You couldn’t get too close since the valley is very steep so you can only admire the scene from afar. 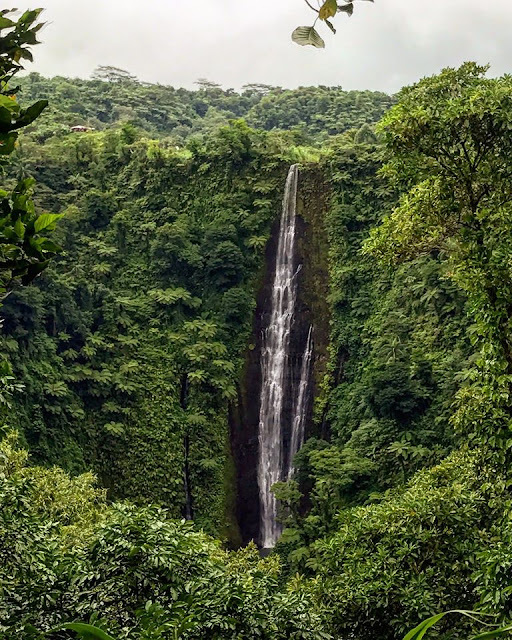 You’d think you would only be able to see this kind of view after a drenching long hike through a jungle, but it was just on the side of the road. 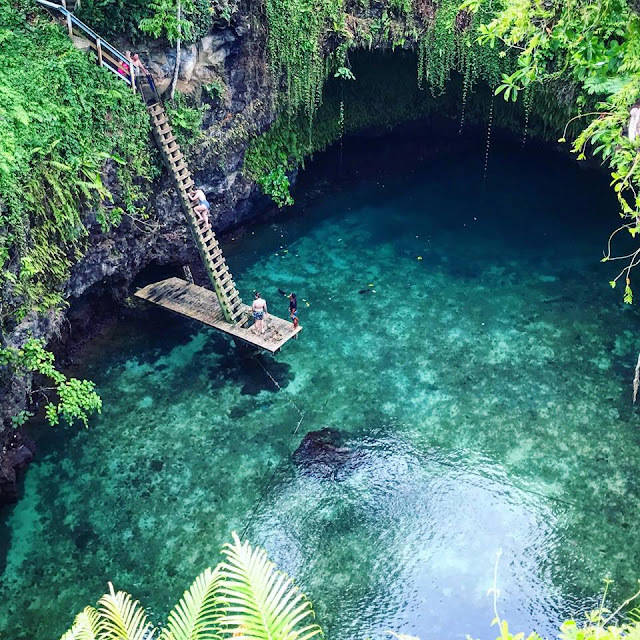 Next stop – To Sua Ocean trench. This was a long drive from the waterfall, through the cross island road and national park. We drove by a village with houses that had triangular flags of all colors hanging along the side of the road. It was a way to welcome visitors the driver said. To Sua is a place I’ve been eyeing ever since I saw it on Pinterest. I couldn’t believe that this kind of place exists. The trench is a very steep climb down some stairs and a ladder, and on the bottom crystal clear waters about 2 meters deep at low tide. There weren’t many fishes in there, just some small ones and tiny crabs clinging onto the mossy walls of the trench. Although To Sua is the main attraction, the scene outside to the ocean is also spectacular. Big waves hit the shore and fill up other secluded rocky volcanic craters along the coast. No wonder the waters down at the trench pulled you in currents. Continuing East on the Southern round island road, we head to Lolomanu beach. 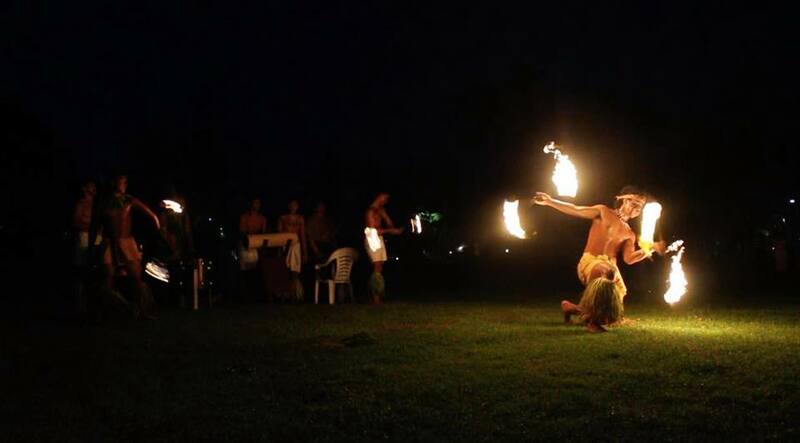 It’s one of the most famous on Upolu, with white sands and crystal clear water. There were bungalows for rent at a very cheap price. It also has a mattress and mosquito net in case you wanted to nap. There were not much to see underwater, mostly just wavy sand becoming deeper and deeper as you head towards the ocean. It was kind of Virtual Reality like when I was down there snorkeling. Next thing I knew I was choking in water, and yelling for help with the very tiny moments I had above water. I was actually drowning, I never thought this would happen. I was brought further and further away from the shore by the currents. Just before I ran out of breath, I was finally pulled to the shore. Still shocked, it took me a few minutes to gather myself. This time, with my snorkel securely on, I jumped back in briefly for a quick swim and then went back to shore. The night was spectacular, it helped me forget my almost drowning incident earlier in the day. I’m thankful nothing major happened, I’m still alive. The bigger island to the west of Upolu was an hour drive to the pier, 2 hr ferry, then more driving to the scenic spots, so unfortunately I can’t see it this time. Instead, I wandered around Apia area to get a view of the city. It was very different from the first day when everything was closed for public holidays. The local markets were bustling, people were on the streets selling all kinds of goods. 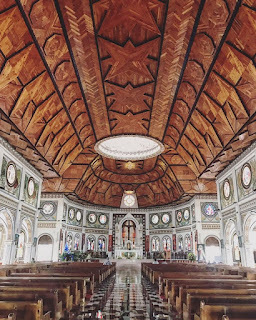 There was a beautiful church just across the tourism office, and the interior is stunning – carved wood ceilings with a small ceiling painting and stained glass all around. From the outside it looks like a fairytale castle as it is a more modern church. I also found a Samoan flag in their local store. The cashier was Chinese and she asked me “Are you from China?” (She obviously was, I could tell from her accent). I didn’t even think and just naturally shook my head and said “No, I’m Taiwanese.” I wonder if I offended her? She didn’t reply anything though. 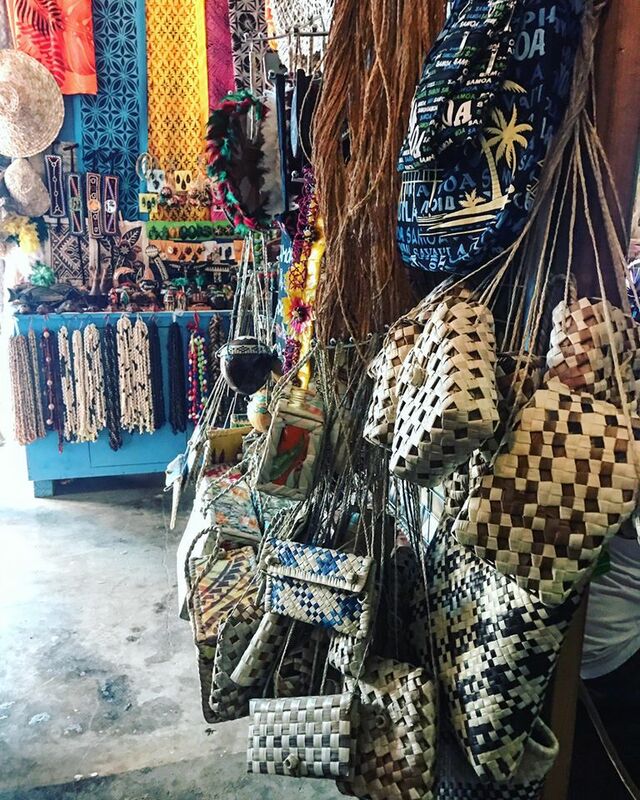 I also went to the flea market in search for some local souvenirs to bring back. I ended up getting a bunch of hand carved necklaces made of young coconut and mature coconut varying in light and dark wood colors. 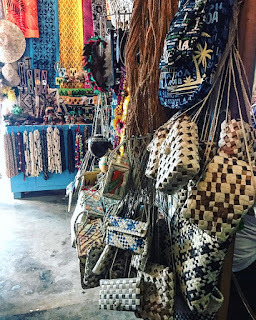 They were between $5 - $10 Tala each, but I bought so much that the lady at the stall gave me a free jewelry holder made from a whole coconut shell with a red Hibiscus flower painted on top. The lady was half Chinese and half Samoan, but she didn’t speak any Chinese. She said that the market place is opened early from 6am to 6pm as there are some early flights out (last minute shoppers would come and sweep the stalls for gifts). Back at the hotel, I took a refreshing shower as I was drenched in sweat from the humidity and heat. A thunderstorm brought pouring rain through the night and the city quickly cooled down. 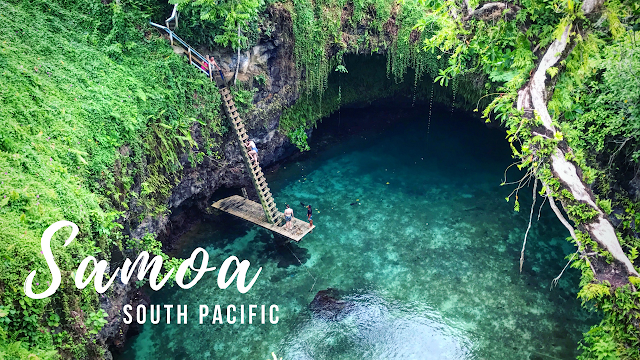 On the last day in Samoa, I woke up really early to head over to the sliding rocks before checking out. It was a series of waterfalls set in a valley tucked away. The walk down from the entrance was many flights down. I had lost count, but it was about 3-4 floors deep. The sun was shining through the plants along the way as it was only 9 in the morning. The staff were still doing their morning clean and no one else was there. I didn't dare actually slide off the waterfall, especially not after the almost drowning accident. 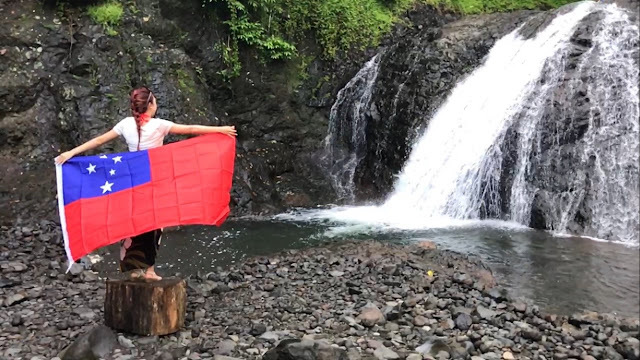 However I did take one last photo of Samoa with me holding the flag up in front of the waterfall. Kicked out of the room by 11am, I sat at the lobby of the hotel. The flight to Auckland wasn’t till 9pm, so it was almost a full day, but too awkward to take a tour as I wouldn’t be able to shower. The wait didn’t feel too long as I was busy editing more videos. It really takes a lot longer than you’d think. I’m really impressed by vloggers who put out 25 videos for Vlogmas at 15-30 minutes each day. I had lunch around 2pm, lounged around some more, and headed to the airport around 7pm. This time the flight is with Air New Zealand. I’ve never flown with them before, but I’ve heard some good things about them. There are just some slight differences, but important ones, like seat comfort, friendliness of staff, and what was offered for entertainment. There were details of all the cities they fly to, including sights to see, hotels, restaurants etc There was also trip advisor you can browse. And also a pretty good game selection. I played through this geography game which gave you hits about a city (picture and text) and then you need to point it out on the map. One that really took me by surprise was a hit for Beijing “formerly known as Peking and has the word’s longest wall…” but the picture of it was the Shrine on waters in Hiroshima, Japan. If you know just a little about Asia, these 2 countries don’t exactly get along because of historical reasons. I can guess anyone Chinese or Japanese would get offended by it. I really hope they fix this error soon before someone from one of those countries notices. I fell asleep shortly after I finished the 90 questions for 90 cities & sites around the word. The flight landed after midnight, and it was a pretty long wait at immigrations and customs at the Auckland airport. Good thing I pre-booked the Skybus shuttle to the city. Also in the middle of the night there’s no traffic, so the drive was quick. The bus stopped at Queens Street shortly after 2am. As I walked up towards the hotel, I can see Sky Tower just 2 blocks away. The streets were empty and it’s hard to believe it is technically already New Years Eve! Ramada’s front desk was closed, and they had left my room key on a locker beside outside the front door. You get a 3 digit code, the lockbox opens, and the card key inside. A little bit of detective feel to it eh? It’s 2am, December 31st, 2016. 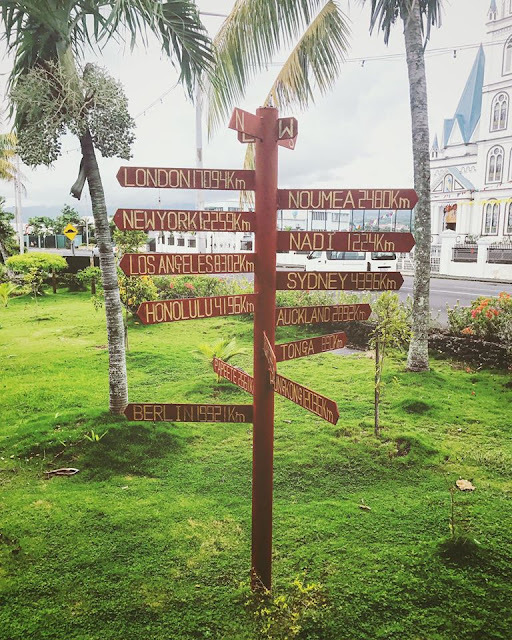 On the last day of this year, I completed one of my 10 goals for the year – to travel to my 25th country by 25. Thank you New Zealand, it’s an honor to be here to celebrate that and head together to the new years with everyone here.